Obituary – Branen, Wilkins Bryan (Smith) « Perry High School Alumni Association, Inc.
﻿Mrs. Sherman ( Wilkins B.) Branen, 76, 1000 Eleventh street, died at noon Sunday at Baptist Medical Center at Oklahoma City, where she had been a patient since last Thursday. Funeral will be at 2 p.m. Tuesday at the Calvary Baptist church with Rev. W. T. Dunn, pastor, officiating. Burial will be at Grace Hill cemetery under direction of Parker Funeral home. Mrs. Branen, daughter of Mr. and Mrs. Webster C. Smith, was born at Perry, July 4, 1906. 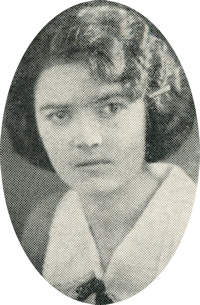 She was a 1925 graduate of Perry high school and began employment that year with Southwestern Bell Telephone company. She and Sherman M. Branen were married March 8, 1927, at Perry. Mr. and Mrs. Branen moved to Cushing in 1927, to Wichita Falls, Texas, in 1929, to Lake Charles, La., in 1941, to Houston in 1950 and back to Perry in 1968. Mrs. Branen retired from the telephone company after 34 years of service. In addition to her husband, of the home, survivors include one brother, Weldon C. Smith, Harrah; and a sister, Mrs. Lillian Harrison, Perry.